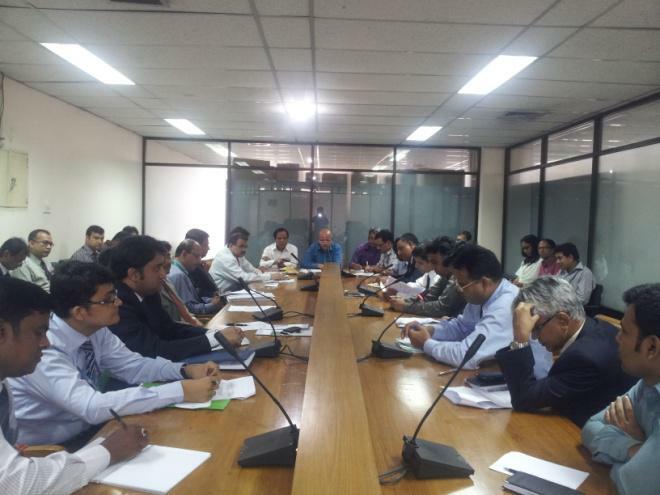 A meeting was held on 29.05.2012 with 22 Banks and 19 NBFIs qualified under JICA assisted Financial Sector Project for the Development of Small & Medium Sized Enterprise. The meeting with Banks was held from 11: 000 AM to 01:00 PM and meeting with the NBFIs was held from 03:30 PM to 05:00 PM at SMESPD, on the same day. General Manager of the SME&SPD and also the Project Director of FSPDSME project, Sukamal Sinha Choudhury presided over the meetings. GM congratulated all the officers present in the meeting for their being qualified in the preliminary selection list of JICA project. The officers working in the project Implementation Unit of Bangladesh Bank were introduced to the participants of the meeting. The officers of Banks & NBFIs were informed that Participation Agreement between Bangladesh Bank & other participating Banks & Non-Bank Financial Institutions will be held by 2nd week of June, 2012. A part of officials from different Banks. They were also supplied with specimen copy of participation agreement and advised to submit a draft copy before 07 June, 2012. All the officers of banks & NBFIs requested General Manager to arrange the Participation Agreement in a befitting manner with the presence of honorable Governor. GM informed that this will be decided after consultation with the honorable Governor. However the meeting also discussed about SME performances of Banks & NBFIs. All the officers present in the meeting explained their SME initiatives to GM & GM advised them according to their performances. GM stressed on cluster financing, development of easy application form, SME publicity, awareness program and lot of other initiatives. DGMs, Mr. Md. 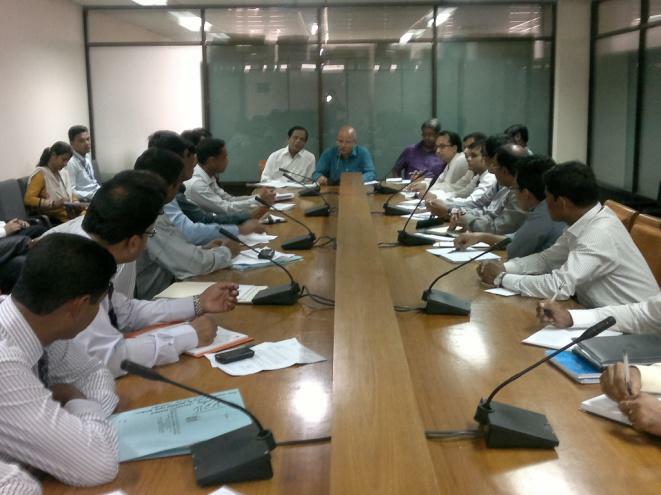 Khurshid Alam and Mr. S.M Ferdous Hossain, and related Joint Directors of SME&SPD were present in the meeting. Deputy Project Director & JD, Md. Ashraful Alam also spoke in the meeting .GM concluded the meeting with thanks to all. The struggle for independence will go in vain if the sectors of economic development, resource utilisation in an efficient fashion and overall maximisation of benefits for all remain unattended. In pursuit of development, the nation duly experienced the taste of growth in microfinance and SME. Prime Minister Sheikh Hasina took pragmatic measures to boost small and medium entities to create opportunities of economic growth and development. Today, SME remains the engine of economic growth and considering the population of Bangladesh, SME offers large-scale employment and income earning opportunities at relatively low costs, especially in the rural areas. It strengthens efforts to achieve high and sustainable growth, which is a prerequisite for an exit from widespread poverty and socio-economic deficit. In the convergence of growth in SME, women entrepreneurship plays a pivotal role. The obligations of society towards such events remain unattended and incomplete. I believe it is time for all to contribute and convert this vision into a sustainable reality. A combined interaction of the forces of population, technological advantages, banking support and market coordination will create opportunities for SMEs to grow and prosper at all levels of development, which are often ignored by the traditional approach to their economic strengths and development potential. The significance of the SMEs is that it is a source of new business creation and employment generation in the developed countries. The recent structural shifts in industrial production from the so-called industrial approach of mass production in USA to a more flexible and adaptable production regime in response to constantly changing market opportunities have led to a notable resurgence of these industries in the west. The re-emergence of the SMEs in the developed world makes economic case for fostering development of these industries more robust than ever before. Defining the potential of women entrepreneurship in support of SME development, the educational status of women in Bangladesh shows that they are being increasingly educated. The employment statistics highlight that women in the rural sector are either self-employed or employed in family-based enterprises that include both agricultural and non-agricultural sectors. These activities that include homestead agriculture, livestock and poultry rearing, fish farming, nursery and tree plantation, tool making, fish net making, food processing, tailoring, and rice processing have been regular and invisible sources to family income supplementation. A sector-wise distribution of employed persons in rural areas shows that agriculture is the pre-dominant source of female employment, followed by the manufacturing sector. Women in Bangladesh are employed in low category jobs. Most of them are employed in agriculture, forestry and fisheries, where the share of the women employees is 78 percent. Together, the various categories of SMEs are reported to contribute between 80 to 85 percent of industrial employment and 23 percent of total general employment (SEDF, 2003). However, discussions surround their relative contribution to Bangladesh’s industrial output due to rarity of reliable information and different methods used to estimate the magnitude. The most commonly quoted figure by different sources (ADB, World Bank, Planning Commission and BIDS) relating to value-added contributions of the SMEs is seen to vary between 45 percent and 50 percent of the total manufacturing value added. We are in a new era of economic development involving diversified models, and at times, the nation’s weakness can become its greatest strengths. It is time to strive on the route and uphold the momentum; SMEs have the potential and can create such dimension to reduce poverty to a satisfactory level. As a core partner, the financial sector is probably amongst the fastest growing segments of most economies. Because of the very nature of the industry, special attention is warranted for improving good governance not merely for domestic efficiency and better flow of international finance but also to avert contagion effects and systemic risks. The opacity, illiquidity, informational asymmetry, and coordination problems aggravate the agency issue in this sector thus calling for substantial regulation and supervision. In recent times the hard and steadfast situations could have been avoided if the investments of the said sector were delegated in many and qualitative folds mainly in SMEs. The risks are low and the returns are equally higher due a mass volume. A time for a focus shift at large appears imperative for all. To conquer and uphold the vision of our nation’s independence, the fore path of development of SME shall steer along as our methodology should be to decentralise financial investments throughout the nation in sections of SME, encourage women entrepreneurs to participate in the event and minimise the bureaucracy of funding into the sector. The intentions are to be widespread based on a similar tune to predict a uniform method to attain success. To conclude, and determine the way forward, one must realise that functioning financial intermediation is of critical importance for SME development, however it is also useful to emphasise that the success of any financial intermediation depends on several factors. The good practices in financial intermediation, especially for SMEs, fall into three broad areas; first, the investment climate must improve through rational policies, better access to finance, and stronger institutions. Second, the financial sector needs to become broader, competitive, and efficient to provide entrepreneurs with alternative sources of investment capital, a diversified selection of new and innovative products, competitive rates, and efficient services to make their investments viable. Third, ratings, improving skills, trades, entrepreneurship, and other business development advisory services would ensure success and help strengthen financial intermediation for SMEs. Thus, a three-pronged programme where the elements are mutually complementary needs to be adopted to build a strong foundation for an efficient and effective financial intermediation system that will support private-sector development and help accelerate economic growth. DHAKA, Dec 17 (BSS) – The fifth FBCCI-SME fair 2011 will begin in the city on December 20 with a slogan-“SMEs and the Nation Growing Together”. Prime Minister Sheikh Hasina will inaugurate the five-day-long fair at 10am on December 20 at the Bangabandhu International Conference Centre (BICC), said FBCCI president A K Azad at a press conference here today. President Mohammad Zillur Rahman is expected to distribute FBCCI-SME award at 6pm on December 23 at BICC, he added. 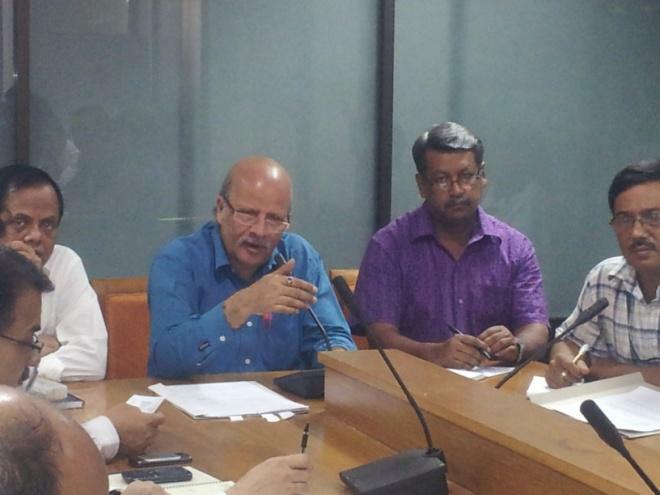 There will be 131 stalls and 19 pavilions in the fair that will remain open from 10am to 8pm upto December 24, said the president of Federation of Bangladesh Cnambers of Commerce and Industry (FBCCI). Sixty-four SME entrepreneur organisations and 34 banks, insurances and financial institutions are taking part in the fair. The participating SME units include plastic, furniture, steel-furniture, textile, handicraft, jute products, biscuits, ceramics, saree, lungi, generator, cable, leather and leather products and herbal. Addressing the press conference the FBCCI president urged the government not to borrow more from banking system, saying that such a borrowing by public sector would reduce credit flow to private sector in future. Suggesting the government to cut subsidy expenditures and re- arrange budgetary allocations to reduce bank borrowing, the apex body president said the government has already borrowed Tk 20,000 crore and placed proposals for borrowing 20,000 crore more. Azad said the country has around 1.5 lakh small and 27,000 medium enterprises that have employed over 1.5 million people and this sector’s contribution to the national economy is about 25 per cent. He said the Federation of Bangladesh Chambers of Commerce and Industry (FBCCI) organised the first SME fair in 2002 with an objective of expansion of the sector and introducing the products of this potential sector in home and abroad. Azad said distribution of FBCCI-SME Award is an important part of the SME fair. Three awards will be given in the categories of medium enterprises and small and cottage industries, he said, adding that one Best SME Facilitator Award will be given for playing outstanding role in SME development category. A six-member jury board comprising businessmen, journalists and researchers has been formed for selection of SMEs for the awards, he added. Three seminars will be held at the BICC’s media centre during the fair. Fist seminar on Infrastructure Development and Sectoral Zones for SMEs in Bangladesh will be held at 11.30am on December 21, the second one on Women Entrepreneurs in SMEs: Bangladesh Perspective at 2.30pm on December 23 while the third seminar on Access to Finance and Technological Upgradation for SMEs: Bangladesh Perspective at 2.30pm on December 23. Media partners of the fair the Daily Samakal and the Financial Express will publish special supplement on opening day of the event. DHAKA, Dec 11: A five-day Small and Medium Enterprises (SMEs) fair will begin on December 20 at the Bangabandhu International Conference Centre (BICC) in the city. Federation of Bangladesh Chambers of Commerce and Industry (FBCCI), the country’s apex trade body, is organising the fifth SME fair, according to a FBCCI release. Prime Minister Sheikh Hasina is expected to inaugurate the fair while President M Zillur Rahman will distribute SME awards among successful entrepreneurs on December 23. The SME Foundation yesterday launched a competition to generate new and potential business ideas from the country’s small and medium entrepreneurs. In association with Banglalink, the country’s one of the top mobile operators, the state-run agency unveiled the “SME Business Plan Competition 2012” to create more enterprises and entrepreneurs to foster faster economic growth in the country. Prof A K Azad Chowdhury, chairman of the University Grants Commission, opened the competition at a ceremony at the Nabab Nawab Ali Chowdhury Senate Bhaban of Dhaka University in the city. Under the competition, the orgnisers will seek, through newspaper advertisements and other campaigns, proposals from the current students and fresh graduates of both public and private universities, who are looking for jobs. New and existing entrepreneurs will also be able to participate, said a statement of the foundation. The prospective applicants will have to collect application form and submit the filled-in form at the headquarters of the Foundation within next one month. They can also apply online at www.smef.org.bd. A preliminary evaluation committee will evaluate the applications and pick up 120 entrepreneurs, and they will take part in a training programme to learn about the techniques of business planning. A jury board will then choose the three final winners, who will get Tk 5 lakh, Tk 4 lakh and Tk 3 lakh as prize money. The foundation plans to hold the prize giving ceremony in April next year. Solaiman Alam, head of marketing at Banglalink, also spoke. BOGRA, Nov, 27: Anser Ali 60, from Bujruk Shokra village under Shibganj upazila of Bogra district, a grower of exotic vegetables, has brought a tremendous change in his life cultivating uncommon vegetables like asparagus in his land. He usually sells them in Dhaka and Cittagong between February and March earning around Tk 70 thousand a year. February to March is the peak time for asparagus. He started farming foreign vegetables about 20 years ago on 7 decimals of his land by investing only Tk 200. For his outstanding contribution in farming foreign and local vegetables, he received Tk 3.5 lakh as prize money from Bangladesh government in September this year. Agriculturist Md. Mahatab Uddin encouraged him at the outset to cultivate capsicum in 1992. His first harvest was not successful due to lack of knowledge on cultivation methods. He cultivates 600 decimals of land in the winter season and 231 decimals in the summer for supplying foreign vegetables to some multi-star hotels in the capital. He said his annual profit has reached 2.7 lakh from selling vegetables like pepper, capsicum and asparagus etc. He further said he has been producing commercially sweet corn, hybrid cabbage, hybrid onion and some other foreign vegetables. He pointed out that getting quality seeds is one of the vital setbacks in cultivating foreign vegetables in our country. With the profit out of selling vegetables, he has purchased 429 decimals of land and is running his family as well as repaying his loan. He also claimed, he supplies 20 varieties of foreign vegetables to 8 customers in the capital. He has created job opportunities for local jobless men and women in his vegetables fields. He now wishes to export vegetables if he would get government assistance in this regard. Lack of transportation facilities is one big problem for foreign vegetables cultivation. Railway is the most effective transportation though there is no direct railway communication from Bogra to Dhaka and Cittagong. For that reason, vegetables cultivators have to spend huge money as truck fares. He said, the foreign vegetable cultivation can be profitable and may contribute a lot to our economy if the authority pays heed to cultivators and their problems.